Updated 5:30 p.m. Eastern with docking. WASHINGTON — Three new crewmembers are on their way to the International Space Station after a successful Soyuz launch Dec. 3, less than two months after the previous crewed mission suffered an abort during launch. 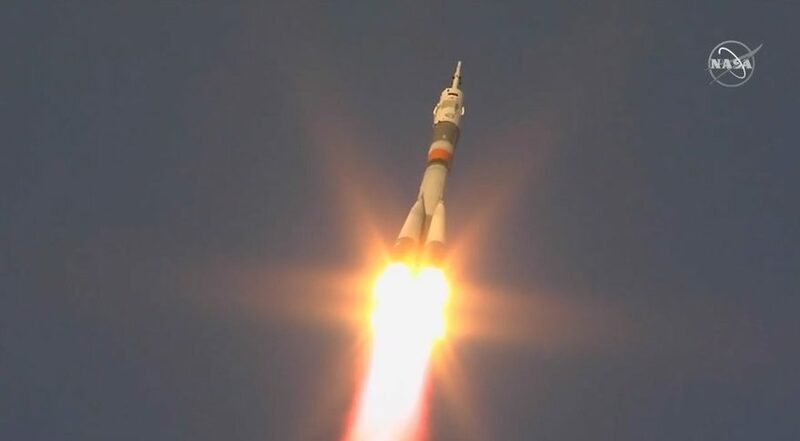 The Soyuz spacecraft carrying the Soyuz MS-11 spacecraft lifted off from the Baikonur Cosmodrome on schedule at 6:31 a.m. Eastern, reaching orbit nine minutes later. The spacecraft docked with the Poisk module on the station’s Russian segment at 12:33 p.m. Eastern, with hatches separating the Soyuz and station opening two hours later. The Soyuz spacecraft carries Russian cosmonaut Oleg Kononenko, American astronaut Anne McClain and Canadian astronaut David Saint-Jacques. The three will stay on the station for six and a half months, briefly overlapping with the current ISS crew of Serena Auñón-Chancellor, Alexander Gerst and Sergey Prokopyev. The launch comes less than two months after the aborted Oct. 11 launch of the Soyuz MS-10 carrying NASA’s Nick Hague and Roscosmos’ Alexey Ovchinin. A booster malfunction two minutes after liftoff triggered the Soyuz’s escape system, sending the spacecraft away from the rocket. The Soyuz capsule landed safely downrange from the launch site in Kazakhstan, with Hague and Ovchinin unhurt. An investigation led by Roscosmos, with NASA as an observer, concluded that one of the four side boosters on the Soyuz rocket was installed improperly, causing it to recontact the core stage during separation. Four Soyuz launches have taken place since that failure, all without incident. Saint-Jacques said his confidence in the Soyuz spacecraft was bolstered by the fact that, despite the abort on the previous mission, the crew returned without injury. “In a way, witnessing that event to me was actually reassuring,” he said. The accident and resulting change in launch schedules did affect the Soyuz MS-11 crew. Their launch was moved up from Dec. 20 so that they could overlap with the current crew, who will now return to Earth in their Soyuz MS-09 spacecraft that day. That required some compression of the final training schedule for the new crew. “In the scheme of things, our training being a couple years, losing a couple weeks overall didn’t have a huge impact on us,” McClain said. She added there was no change in training on the Soyuz vehicle itself as a result of the accident. The new crew will be busy on the station as soon as they arrive. A SpaceX Dragon cargo spacecraft is scheduled to launch Dec. 4, berthing with the station two days later. The spacecraft is carrying nearly 2,600 kilograms of cargo in the form of supplies and scientific experiments. Kononenko and Prokopyev are scheduled to perform a spacewalk Dec. 11 to inspect the exterior of the Soyuz MS-09 spacecraft, which suffered an air leak in its orbital module in August. Kononenko said at the pre-launch briefing that the two will collect samples of the micrometeroid and orbital debris shielding there that might have been damaged by a drill during pre-launch preparations. Those samples will be returned to Earth for investigation.